Google's Saurabh Sharma announced yesterday on Google+ that they are releasing slowly the ability for users and businesses to create their own vanity or custom URLs on Google+. 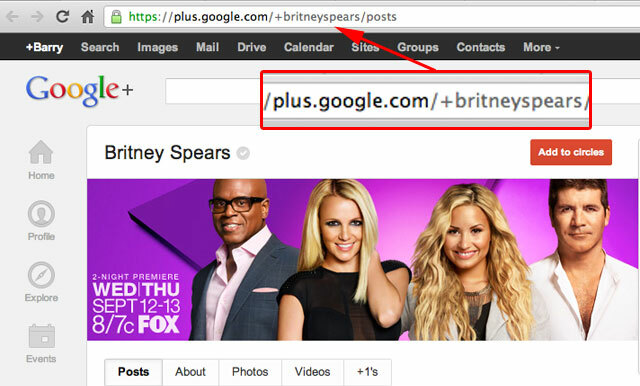 For example, Britney Spears's page is at plus.google.com/+britneyspears/ while mine is at plus.google.com/112116680648779331229/. At first, we're introducing custom URLs to a limited number of verified profiles and pages. But over time we plan to offer custom URLs to many more brands and individuals, so please stay tuned! I do hope Google 301s the old URLs to the new vanity URLs. Right now, both plus.google.com/100000772955143706751 and plus.google.com/+britneyspears/ return the same page with the same content. They are using a canonical tag, which I thought is a bandaid approach. Forum discussion at Google+ & Google Business Help.